Born on December 6, 1989, Deshauna Barber is an American Army Officer and a beauty pageant holder who was crowned Miss USA 2016 on 5th June. With her father being in U.S. military, she actually lived at different places while growing up and herself joined the United States Army at 17. 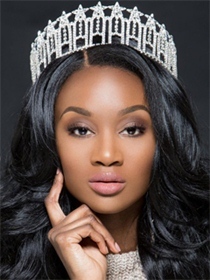 After completing her education and serving in the army for a few years, she decided to take part in the beauty pageant during 2015 and was crowned Miss District of Columbia USA 2016. This was followed by Barber’s participation in the Miss USA 2016 where she was crowned the winner on June 5, 2016 by outgoing Miss USA, Olivia Jordan. This made her the 8th African America female to win the crown. This victory has earned her the right to represent USA at the Miss Universe 2016 pageant. She joined the United States Army at the age of 17. The runner-up to her in the Miss USA 2016 is Miss Hawaii Chelsea Hardin. The reason she wanted to win the Miss USA pageant was to break stereotypes. Her previous titles include Miss Virginia International 2011 and Miss District of Columbia USA 2016.